Andrew Carter, who enjoyed a successful period on loan with Glamorgan earlier in the season, is returning to the SSE SWALEC for a second short spell. The 29-year-old played three matches for the Welsh county in April, taking 12 wickets at an average of 27.08, and is set to return in time for their match against Leicestershire starting on Monday 22nd June. The previous loan deal was ended one game early as Nottinghamshire recalled the Lincoln born seamer ahead of their LV= County Championship fixture against Durham. 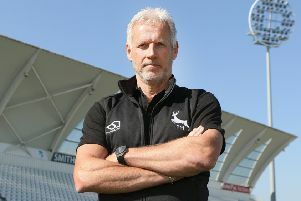 “During Andy’s previous spell on loan with Glamorgan he did what we wanted, which was bowl himself into contention for a first team place back with Notts,” said Nottinghamshire director of cricket Mick Newell. Carter, who has played 27 matches during his first-class career taking 82 wickets at an average of 29.32, is eligible for Glamorgan’s matches against Leicestershire, Derbyshire, Essex and Lancashire. He remains eligible for selection for Notts Outlaws in NatWest T20 Blast cricket.